"A spoonful of sugar is all it takes, it changes bread and water into tea and cakes." Mary Poppins: She mysteriously arrives at the Banks' household to nanny for the children, but is actually saving the entire family. Since 1964, this plot is near and dear to the hearts of most everyone. And how could I forget - she is practically perfect in every way (here is where I start bopping my head back and forth to the tune and beat of this song). 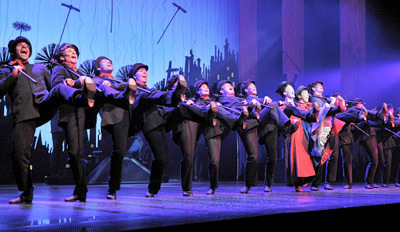 Broadway Across America has gifted Salt Lake City with the touring company of Mary Poppins. I'm not going to go into gory details like I normally do; if you want details, go to this review. I find myself so caught up in the magic tricks, the choreography, the eye-candy colors everywhere, that I forget the world around me. I love so much about this show I don't care about weak plot points or things that don't make sense, like the ridiculous resolution of George Banks' conflict or the strange statue that comes to life or the word-seller Cajun lady. There are also some rather boring moments for me, but I'd say only twenty or thirty minutes of the two and a half hour show fall into that category. This Mary Poppins is more from the books than from the Disney classic movie, so be prepared for someone who isn't a saccharine as expected. Also, there is a number involving toys coming to life that would scare me to death if I were a child but I giggled right through it this time because I looked around at the audience and saw their shocked looks of horror. Ha. Consider yourself warned. It really isn't that bad, just entirely surprising. Notice things like the use of color in costuming and lights to show stark contrasts, the lighting design to make you feel you are amongst the stars, and the clever tricks in almost all of the scenery and set pieces. My favorite part? Step In Time! The cost of admission is worth it for this number alone. You may think I'm kidding, but I'm going to be purchasing a ticket today to see the show again. 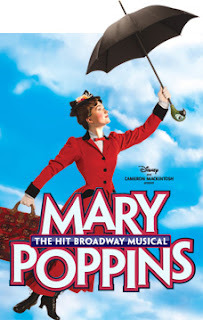 I cannot tell you the excitement bubbling up in me (and I'm smiling foolishly and getting all jittery and excited while writing) that now all of those in the Salt Lake area can finally know what I am talking about when they ask if I've seen Mary Poppins and I squeal, "Tap. Dancing. ON. THE. CEILING!!!" Yes, I really squeal it. Yes, I really put that much emphasis on it. During Step In Time, I half expected Mary to look out at the gaping-mouthed, gasping audience and repeat her earlier line, "Close your mouth please. We are not a codfish." Three of the four of us who have season tickets together regularly write our thoughts on shows for public domain, two of them for a very popular local theater review site. As we walked out, I said to the group, "You know, shows like that make me not care about dissecting anything or critiquing. They just make me feel happy. I don't care about anything else. This show makes me ridiculously happy." And even the most critical of them agreed, adding that he appreciated the great morals and family value lessons in the show. I saw the show in New York City back in 2007, then again in 2008. Since then, I've tried to recommend this show to all of those going to NYC, as a "fun, family friendly, big Broadway show." Unfortunately, most of them opt for the spectacle of Wicked or the latest trendy performance. But now they flock to Mary Poppins because it has come to their front door. You all know what I'm talking about now, don't you? Listen to this girl! 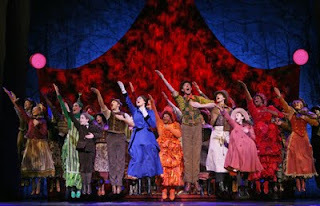 I know my Broadway! Were you suprised how much of the props and special effects they brought to the small stage? I'd actually consider seeing this... Just for the creepy moments, of course. I'm going on Thursday with the family! So so so excited!!! 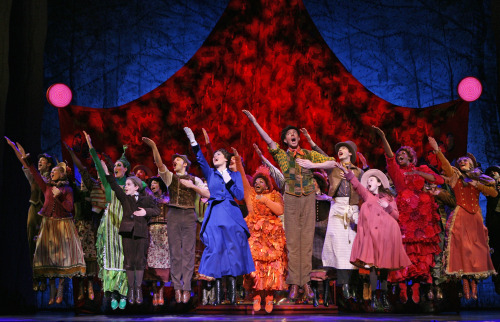 I was SO nervous that they wouldn't be able to transfer the effects from Broadway onto the small stage. I kept saying, "I hope she flies over the audience at the end and they still tap dance on the ceiling! It just won't be the same without it!" Very impressive. I am going again this weekend. The were rehearsing next door to us in The Rose Wagner. It was distracting (because all te separated us was an air wall partition) but so much fun!